Regular maintenance and cleaning should begin immediately after the carpet installation is completed, some installers and manufacturers still recommend regular drag-brushing and no more, this is not adequate to keep the surface free draining and in good condition. All organic matter should be removed from the surface as soon as possible. Playing on a surface covered in leaves and debris leads to a rapid breakdown of the organic matter, this is then pushed down into the infill by foot pressure, likewise drag brushing when debris is present will break the debris into smaller particles which are then pushed down into the surface, eventually these particles in combination with broken fibres, atmospheric pollution and algal growth will lead to failure of the drainage characteristics of the infill material, this in turn renders the surface dangerous and unplayable with the resultant need and significant cost of a major renovation. Most surfaces with sand infill are either designed to be sand filled or dressed, with the majority of sand filled carpets designed to be filled with sand to within one or two mm of the surface. The sand is there to support the pile. Carpets that are under-sanded will suffer excessive foot wear and the pile will fold allowing more of it to come into contact with feet, brushes etc, shortening its life span. Excess sand can be dangerous on the surface for football, tennis and multi-sports surfaces although some hockey players find this desirable as it limits foot lock, so a balance has to be found. The new artificial clay tennis courts are purposely overfilled with red coloured sand to try and mimic clay court characteristics, with these it is desirable to be able to slide on the surface. The most effective machine for regular use on a sand filled or sand dressed tufted surface is an Aussie cleansweep. These machines can be used by most, as they are simply pulled around collecting debris, this can then be shaken off at a collection point for later removal. 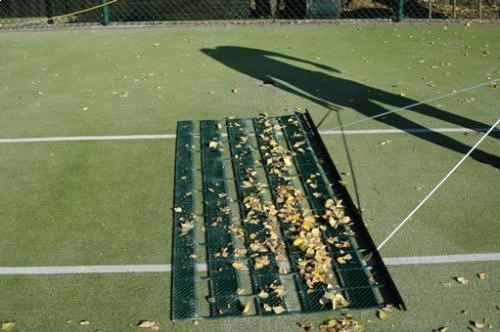 The cleansweep is also very effective at levelling surface sand out and working new infill material into the surface, they are particularly effective on Artificial clay courts. The cleansweep machine will not work effectively on needle punched surfaces ie Playrite matchwinner. On these surfaces the use of a leaf blower is recommended, care must be taken under dry conditions not to blow the sand off the surface. Petrol engined sweepers or powerbrushes can be used to great effect on these surfaces not only for removing debris but also to keep the infill de-compacted and to straighten the carpet fibres, again these machines should be used with care so as not to remove too much infill. When using a powerbrush to remove moss from the surface the moss should have been sprayed first to kill it, it is almost inevitable that some infill material is going to be removed from the surface, this should be replaced as soon as possible with the required grade of specialist silica sand. A push along centrifugal or drop spreader is the easiest way to distribute the new sand. Small ride on tractors with attached brushes should be avoided, in my opinion, as the brushes are never stiff enough to counteract the compacting effect caused by the tractor wheels. then moss spraying should be carried out regularly twice a year, to coincide with the main growth periods in spring and autumn, with spot spraying in between times. Algon although no longer sold as a moss killer is particularly effective. Heavy moss infestations can be removed mechanically with a Top Keeper Pro. It is much better to implement an effective moss prevention plan from day one rather than to use fire brigade tactics. Algae becomes more and more of a problem as the climate changes and a larger proportion of the year becomes favourable for algal growths. The typical scenario within the lifecycle of these surfaces is that they remain free draining and moss and algae free, for the first few years, Drainage depends on the location and the amount of contaminants that are in the sand infill, these can be organic or atmospheric in nature, as the contaminants build up in the surface, drainage levels start to fail. Initially you will notice the court takes longer to drain after heavy rain, this is the first bad sign, Once drainage is compromised and the weather is warm and wet you have the ideal conditions for algae to grow. This is typified by patches of sludge appearing in the low areas on the court. The sludge can be repeatedly removed with a power brush or similar, the area can then be sprayed with an algaecide, this should be worked into the surface as much as possible and repeated, 7-10 days, after the initial application. The contamination and contaminated sand needs to be replaced with new this is a specialist operation known as a refurbishment or restoration, and these processes costs a considerable amount. That a specialist contactor is employed with a machine to deep clean the surface, these machines lift the sand infill sieve it and then use vacuum extraction to remove fine contaminants. This operation should be carried out at least annually. As an alternative to deep cleans for in-house maintenance the top layer of sand can be removed and replaced on a regular basis. The surface should be sprayed with a chemical to kill algae and moss spores before re introduction of the new sand. The above represents the ideas and information gained by Sweepfast ltd at this time and should only be used in conjunction with guidelines from your manufacturer and installer. We are happy to give advice at any time with regard to any aspect of the maintenance of these surfaces.